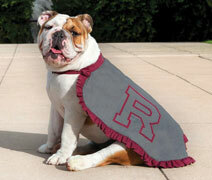 At the University of Redlands, students can pursue their passions and potential. In the heart of sunny Southern California, the University of Redlands campus stands out as among the most beautiful in the West. Our 160-acre campus features a mix of classic and contemporary architecture, lush green trees, and friendly faces wherever you go. There’s a vibe at Redlands that welcomes you with open arms and inspires you to try new things: an atmosphere that invites you to take the time to find what’s meaningful and encourages you to pursue it with passion; a community that enjoys being together and shares a commitment to understanding the world and making a difference. The historic college town of Redlands has a vibrant downtown a mile from campus, with local eateries, coffee shops, and a year-round weekly farmers market. With an average daily temperature of 70 degrees and easy access to Los Angeles, the desert, mountains, and ocean, Redlands is an idyllic place to get the most out of your college experience. More than 2,400 undergraduate students study in 50 academic areas that span humanities, social sciences, physical and natural sciences, the creative arts, pre-professional programs, and our innovative Johnston Center for Integrative Studies. Our newly redesigned core curriculum is flexible and focused, allowing you to explore multiple interests or a single passion from numerous angles. We encourage you to ask big questions that transcend an academic discipline; interdisciplinary studies are at the heart of a Redlands experience. Additionally, the curriculum acknowledges that communication—written and oral—is important in all professions and the community at large. Regardless of your passions, you’ll explore and sharpen professional and transferrable life skills. The focus of your education will also be personal. Students are engaged in close-knit classroom environments, with faculty mentorship integral to your four-year experience. A student-faculty ratio of 13:1 and average class size of 18 ensures you’ll connect with faculty in and out of the classroom. Approximately 40 students enroll each year in the Johnston Center for Integrative Studies. As a Johnston student, you’ll take charge of your education by designing your own program and interdisciplinary courses. Working with faculty mentors, you’ll put together personalized contracts that emphasize areas of interest and academic goals. No grades are given; you’ll receive extensive written evaluations from your faculty. Johnston students live and learn in a two-hall complex that includes residence rooms, faculty offices, classrooms, and community spaces. Johnston is one of the first and longest-running alternative disciplinary programs in the nation. Creativity is important at Redlands, with many students active and engaged in the arts. The School of Music is the second oldest in California, and whether you’re a Music major or someone who simply can’t imagine life without it, you’ll have access to the same facilities and talented studio faculty. Beyond music, you can also pursue a passion in Creative Writing, Studio Art, Theatre, and Theatre Business. Outside the classroom, Redlands is an active and dynamic community. We’re a place where students can become involved in a myriad of opportunities and grow as leaders. You’ll draw upon over 100 years of traditions—from a commitment to community service to the nonsensical Och Tamale chant—for your own quintessential Redlands experience. 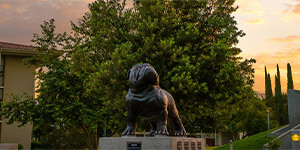 The athletics program at Redlands is one of the most successful NCAA Division III programs in the West, with one in five students participating in 10 men’s and 11 women’s sports. The Bulldogs have won more than 50 conference titles in the past decade as well as 14 individual national titles. As a Redlands student, you can choose from over 100 study abroad destinations. You’ll join more than half the University’s undergraduates in your study abroad pursuits. One popular destination is Salzburg, Austria; more than 3,000 students have embarked on this signature experience for nearly 60 years. Students reside and study in a nearly 500-year-old Renaissance building overlooking the ancient heart of Salzburg. No matter where you choose to go, you’ll take your scholarships and financial aid package with you, making international study affordable. After you cross the stage, you’ll join the University’s extensive alumni network. Forbes ranks Redlands in the top 5% of all colleges in the nation for career prospects for alumni, high graduation rates, and low levels of debt for graduates. Nearly 90% of our recent graduates were employed or pursuing an advanced degree one year after graduation. Alumni have been hired by Apple, Boeing, Disney, Google, J.P. Morgan Chase, the National Park Service, the Peace Corps, and other well-regarded employers. 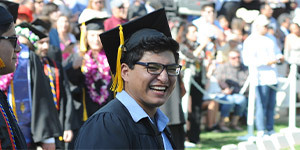 Redlands is committed to making your education valuable and affordable. More than 90% of students receive some type of financial assistance in the form of scholarships and/or grants each year. All students who apply for admission are considered for merit scholarships ranging up to $30,000 per year in value. Redlands also understands the importance of graduating in four years. Through collaboration and advising with faculty, you’re guaranteed a pathway to graduate in four years—that’s the Redlands Promise. Visit redlands.edu to learn more about how Redlands is yours for the making.